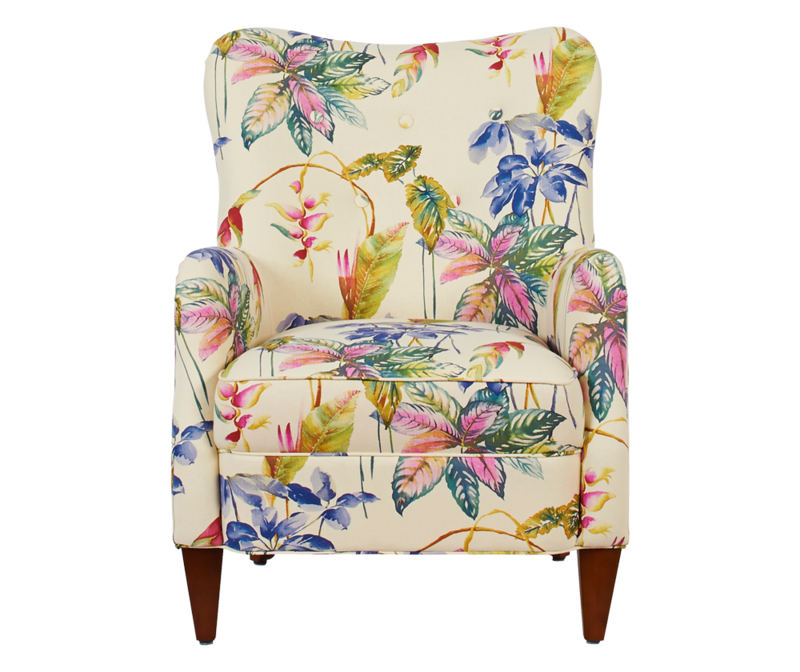 The Paradise Collection floral-print upholstered arm chair by Jennifer Taylor Home is the perfect addition to any living space looking to add a splash of color and fun. The premium fabric features a beautiful and colorful tropical floral-print that is made of a cotton and linen blend engineered for long life. The sturdy solid wood frame is made from kiln-dried birch to provide exceptional long-lasting support and stability. An ideal choice for the entryway, hallway or bedroom, the Paradise arm chair brings class and lounging comfort to any room in the home. Jennifer Taylor Home offers a unique versatility in design and makes use of a variety of trend inspired color palettes and textures. Our products bring new life to the classic American home. 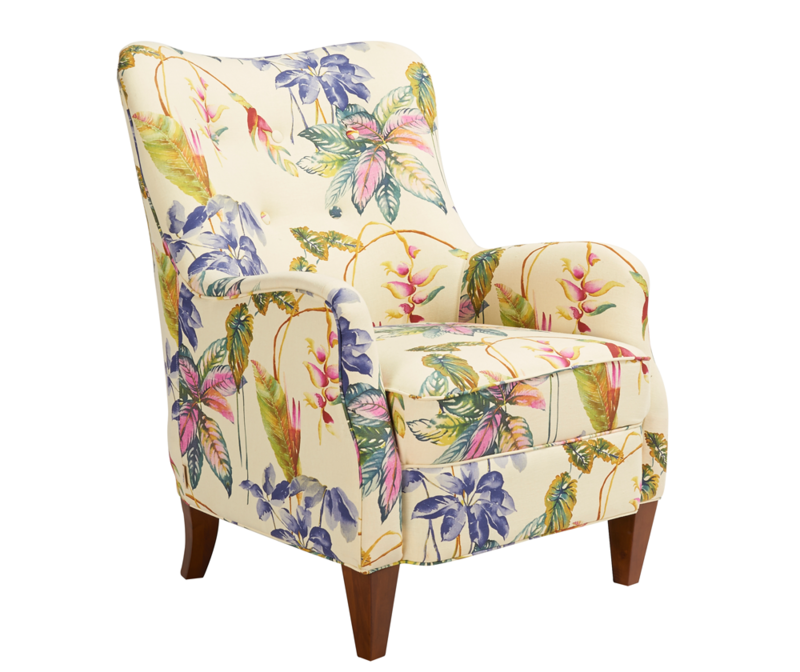 Prepare to fall in love with the Paradise chair, as it will add an infusion of glamour to any space. This chair is the perfect addition to any living space looking to add a splash of color and fun. From its handmade, wooden legs to its button tufting, every inch is simply the best and built to last. The premium fabric features a beautiful and colorful tropical floral-print that is made of a cotton and linen blend. Absolutely gorgeous, these family friendly chairs were stunning against a taupe gray wall with teal silk drapes. Came quickly, well protected and just what we needed. This is the coolest chair I have ever purchased! It brightens up my living room so well! The colors match the greens, blues and the magenta in my room, matches perfectly!! These beautiful upholster chairs added the pop to my living room that I was looking for. The colors are vibrant and they are so comfortable. I have never before purchased furniture on-line, but after lots of searching at my local furniture stores and not finding anything I liked, I turned to online. I am so happy that I did! I am re-doing all of the rooms in my home and I have found everything I need/want here. I bought two of these chairs for my up-dated cottage-style living room. They are gorgeous and I really love them. They were carefully packed and arrived in perfect condition - and a week earlier than originally scheduled. They are so easy to set up...all I had to do was take them out of the box, screw in the legs and they were ready to go. And even though these chairs are on the lighter side, they are very sturdy and very well made. The bolts on the legs are extra long so the legs are very securely attached and do not wobble at all. Also, I would say that the colors in the upholstery are accurately represented on the computer monitor. I'm just really in love with these chairs. I can't wait for my other purchases to arrive!